The king of the crystal throne returns for his final season, but should he be praised? Breaking Bad, at its core, has always been about a man trying to help his family and in the process discover what he is truly capable of. 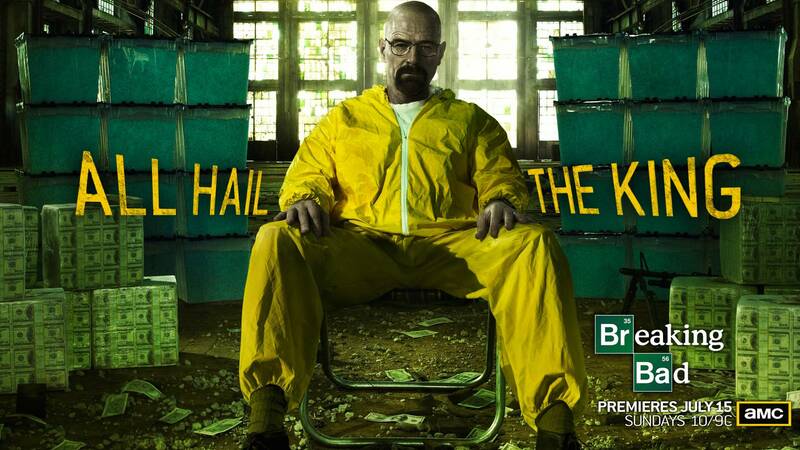 Last season, viewers truly discovered just how conniving and deceitful Walter White can be. Now with his boss and nemesis Gustavo Fring dead and the cartel eliminated , Walter is now free to reign with an iron grasp. This would be all good and fun,but with everything taken care of and Walt at the top (seemingly), where does this master chef go from here? “Live free or die” tries to open up some new possibilities for this season, however comes to rely overly on cleaning up past mistakes. The episode opens with a rather unusual scene: a noticeably aged Walt with hair, sitting at a dinner. Here he meets an old friend who supplies him with a few assorted items, such as a giant machine gun, and leaves him on his way. Rather pleased, Walt drives off as the title screen appears. Similar to season three, with the black and white intro depicting the grisly repercussions of Walt’s actions, Vince and his gang are clearly building up to something gigantic. I would have no issue with this if it were not for the fact that viewers are likely not going to see the unfolding of these events until next summer (as this season was split into two). Of all the season intros, especially last year’s great episode “Box Cutter”, this intro missed the mark for me, and came to signify how this episode turns out overall. After a confusing intro, the episode got back on the straight and narrow by focusing on the obvious question: what to do now that Gus is dead? After hearing about Gus’s death on television, a panicked Skyler calls Walt. “What happened?” Skyler shockingly asks Walt. “I won,” he boldly replies. For me this line seems to perfectly sum up Walt’s character for the beginning of the season. He is now on top and knows that no one can touch him. 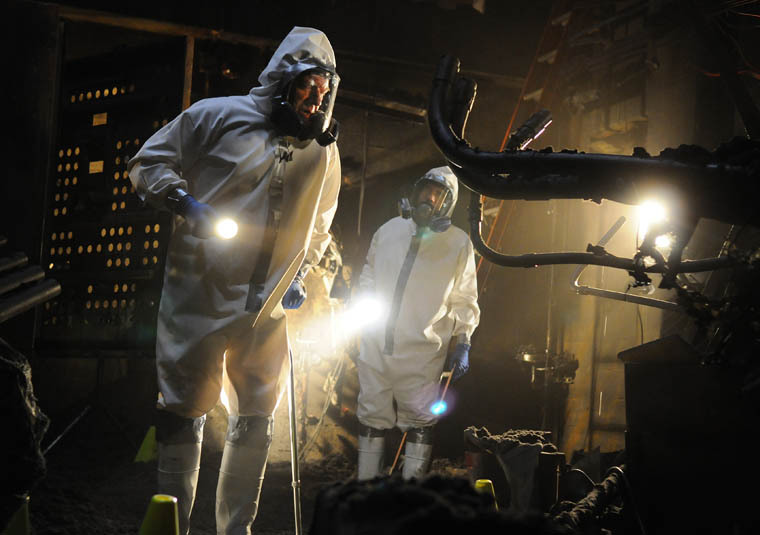 This comment comes to be tested quite suddenly, as viewers are treated to the aftermath of the lab that Walt and Jesse burned at the end of the season, and the man who is investigating it all: Hank. Stumbling through the rubble that was once a great super lab, Hank comes across the remnants of a camera, which more importantly can lead to whom exactly was using the lab. However, Walt and Jesse are well aware of the cameras and so this becomes the prominent issue in which they must face in this episode and leads to some interesting moments. After begrudgingly receiving the aid of Mike, whom just discovered the death of his former employer, the trio decides to get rid of the evidence in what turns out to be a mini-heist adventure, the word adventure being used loosely. As Walt and Mike contemplate how to get the evidence from the police, Jesse comes up with the perfect plan, only to be comically ignored over and over. It is nice to see Jesse be the ideas man of the group, and not always reliant upon Walt. However, with Walt becoming the self proclaimed king of crime it will be interesting to see if this lasts, let alone if their partnership will, but I digress. Jesse’s plan is simple. Create a large enough magnet in order to erase all of the data on the cameras and laptop in which Gus used to watch them. After all of Jesse’s dumb ideas and plans (look no further then the bathtub scene in the first season), it actually works, but not perfectly, as the magnets are a little too powerful. This turned out to be a rather comical scene that actual leads to a big revelation. Amidst the confiscated items, now destroyed due to the magnet throwing everything about, the police find an address underneath one of Gus’s pictures. To where it leads is unknown, but if I were to make a guess I think it has to do with his time in Chile and his old partner. Never the less, this will hopefully lead to more explanations instead of more questions in the coming episodes. After seemingly removing all evidence, Walt came to meet with Saul to discuss future endeavours. As Saul pleaded to Walt to get out while it was good, and told him that their partnership was done, Walt simply shrugged this off and menacingly disagreed: “We’re done when I say we’re done,” Walt snarled, looking Saul right in the eyes. This further proved how Walt believes himself to be king, and that he must be obeyed and respected or else suffer his wrath (kind of like Tuco or Gus). This was an overall great scene and showed the tension that lies not only between Walt and Saul’s partnership, but between Walt’s other partnerships as well. While Walt and Jesse sought to cover their tracks, Skyler came to brush them off. Not only does she come to discover who killed Gus, she also comes to learn that Ted Beneke, her former boss and lover is now paralysed after an incident with Saul’s so called henchmen, who actually did nothing. This was rather a heartfelt moment, for even though Ted was not the cleverest of characters, he did not deserve what occurred. However, what made this situation all the sadder is he now fears Skyler and knows of her misdeeds with Walt. He is victim of their crimes, and knows he cannot tell a word to anyone. With seemingly nowhere to go, the season five opener of Breaking Bad tried its best to answer questions as well as pose some new ones. While “Live free or die” accomplishes this to a degree, it also left me confused by certain routes they choose to make. However, I trust Vince and the gang a great deal and so hopefully these questions will be fleshed out more in the coming episodes, and not be held back until the latter half of the season. Never the less, “Live free or die” was a respectable feat after such a phenomenal season finale, and will hopefully be the foundation for some great future episodes.